The Xero add-on allows you to easily process payroll by sending staff hours as set up in your Ento awards through to Xero, all with the click of a button! 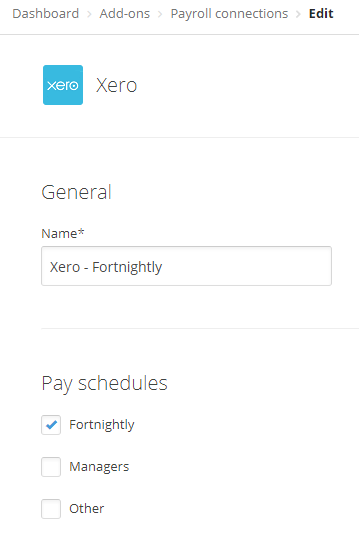 You can also import new Staff from Xero directly into Ento! The Xero integration can be added to your account by navigating to Add-Ons > Xero. Name: The name of the integration that will appear in your list of export options when exporting pay cycle data. Pay schedules: Select which Ento pay schedules you want this specific add-on to send through to Xero. Each section of the mapping list will allow you to map a different type of data to your Xero account, and for each type you can choose whether to send data or not to send it at all. The five sections will have you link the Ento pay schedule, staff records, locations, leave types and earning rates. In some instances, such as ‘Ordinary hours’ on a Salary award, you may choose to handle this in Xero directly, rather than have the exact hours sent through Ento – in that case, this could be left to ‘Don’t send timesheets’. In most other instances, staff, earning rates and leave should all be mapped to ensure that it’s sent through accurately. This should all be set up during your Ento implementation, so for any future changes or additions, it’s advised to chat to Ento Support for assistance. Once you’re ready to send timesheet data to Xero, simply navigate to Payroll & Leave > Pay cycles and click ‘Export’ next to the pay cycle in question. Choose the Xero export type and it’ll display information relating to the transfer of data, including progress and any errors. To see the last three exports to Xero, navigate to the mapping page and you’ll be able to see the last three times the add-on was run, and the results of each. This can be helpful in identifying issues if a result in Xero is different than expected. Once the Xero add-on is set up, simply navigate to Core HR > People > Staff and click ‘Import from Xero’. This will give you the option to import information for any new staff not already in Ento. Check the status of the Xero API on their status page here. For assistance with your Xero system, including importing timesheet files, please contact the Xero support team or your Xero account manager.